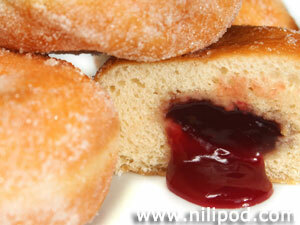 If we are ever walking around town, it is hard to resist popping into Greggs to get some jam doughnuts, not only because they are so cheap, but because they are so sweet and tasty. However, they are really only at their best when they are fresh, as they will soon become stale. 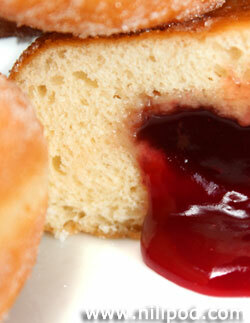 Jam doughnuts could never, ever be described as being even the slightest bit healthy, not only because they are covered with sugar, but because they are deep-fried in oil and therefore quite greasy. Our recipe is certainly healthier, as rather than being fried, we bake them in the oven instead before dipping them into sugar, which is actually easier really. 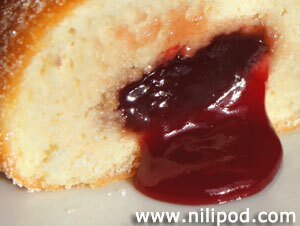 We find that raspberry jam works best in the middle, but that is really down to personal choice, taste and preference. 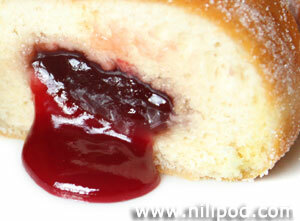 You might prefer blackcurrant or strawberry jam, so feel free to substitute the jam for what you like best. Mix all of the dry ingredients together in a large mixing bowl or food processor. Add in the eggs, olive oil and milk (warm this first if possible, but not too hot or you will kill the yeast). Slowly add the water (also warm if possible to speed up the recipe) and keep mixing until you have made a firm dough. You may not need to add all of the water, so only add what is necessary. Turn the doughnut dough onto a floured worktop or table, and knead it for a few minutes so that it starts to feel more elastic. Using a floured rolling pin, roll the dough out to an even thickness of approximately 1 cm thick and use a large mug or small dish to cut out doughnut-sized circles. Use the remainder of the dough to make some thin sausage lengths. Now, take one of the circles, wet the edges with water and wrap one of the dough sausages around the edge, to form a nest. Next, spoon in a tablespoon of jam, wet the top of the sausage and press another dough circle onto the top, to basically form a circular jam sandwich that looks rather like an Eccles cake. Add all of these 'doughnuts' to baking trays that are lined with greaseproof paper and paint them with olive oil, before sprinkling them with some white caster sugar. 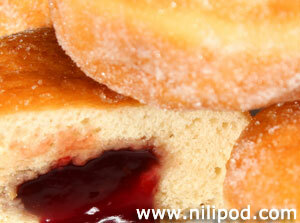 Bake in an oven at around 180°C for between 15 and 20 minutes, until your oven-baked doughnuts become nice and brown. When cooked to this colour, take them out of the oven and sprinkle them with some more caster sugar.